Right-back Kyle Walker, centre-back Nicolas Otamendi, midfielder David Silva and striker Sergio Aguero were also named in the XI. Tottenham were the only other team to have more than one representative, boasting three players in defender Jan Vertonghen, midfielder Christian Eriksen and striker Harry Kane. Manchester United’s only inclusion was goalkeeper David de Gea, while left-back Marcos Alonso was the sole player from dethroned champions Chelsea. Liverpool’s Mohamed Salah, with 30 league goals this season, was also included. 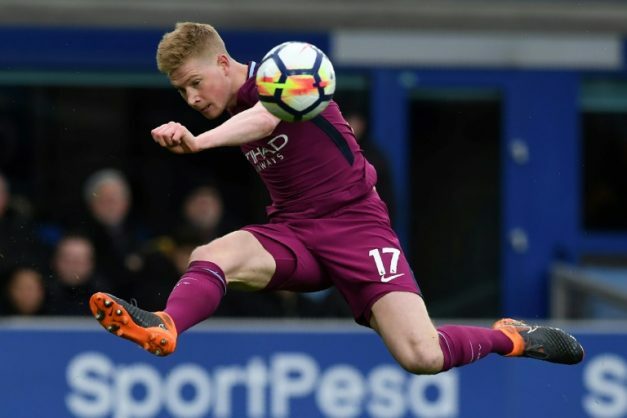 The six nominees for the men’s PFA players’ player of the year award are De Bruyne, Silva, De Gea, Kane, Salah and Manchester City’s Leroy Sane. The PFA Awards ceremony will be held in London on Sunday. PFA members from the 92 Premier League and Football League clubs get a vote.